I love homemade bread, but hate the hassle. Once I discovered Hodgson Mill White Bread Mix and bought a bread-making machine, all my problems were solved! The mix makes a very tasty white bread (to me, at least). Just put butter and warm water in the machine, add the bag of mix, and empty the packet of yeast (included in box) on top. Set the machine and forget it until dinner. Nice! I've gone through 6 boxes so far using the directions on the box with my bread machine[...] and haven't had a bad loaf yet. This bread mix has now become a welcome staple in my pantry. 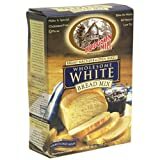 I just started using a bread machine a few months ago, and bought this and the Honey Wheat flavor on Amazon. This is a perfect (and economical) solution for me, as I make about a loaf a week. The flavor and texture of this white bread is excellent. It slices well, and lasts almost a week without refrigeration. It bakes up with a marvelous crust in my machine, an older Panasonic BT55-P. Simple to use, and saves a lot of work over manual baking. I use either unsalted butter or canola oil; margerine does not seem to work as well or taste as good. The only issue with the White Bread Mix is excessive rising. I've solved that by using the 1-pound-loaf-machine formula, rather than the entire (1.5-pound-loaf-machine) box. My machine IS a 1.5 pounder, but this white mix is EAGER. I tried using a tad less than the full packet of yeast with the entire box of mix, but the bread still got huge and stuck to the inside of the lid upon baking. You can either throw out the excess mix, save it up and make a full loaf when you have enough remainders, or run the dough cycle and finish the baking in the oven in a proper bread pan. I have only had the excess rising issue with the white bread mix. The Honey Wheat variety is even more delicious than the white, but does not slice quite as well. It's a tad crumb-y, and maybe a bit softer: excellent for sandwiches. Both make superb french toast. A great loaf of bread!